Albuquerque Beer Scene: No(che) Bueno? It's shaping up to be a pretty slow beer week thus far, so I'm forced to write about a sale on a holiday beer- and not a St. Patrick's Day, or Valentine's Day, or Martin Luther King Day holiday beer. 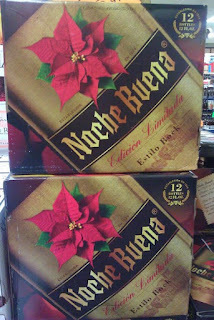 I'm writing about a Christmas beer, and a Mexican one at that. Noche Buena, brought to you by the Mexican brewing giant that produces Tecate, Sol, Dos Equis, Bohemia, and other ballgame/backyard barbecue beers, didn't fly off the shelves like cases of Corona do. Maybe it has something to do with the fact that this beer is in the Bock style, much less pleasant with salt and lime and tomato juice and clam juice and whatever other crap people put in their Mexican beer. You can re-live that holiday magic by picking up a case of Noche Buena for $9.99 at Kelly's on Wyoming and putting on your favorite Burl Ives record.